8 "Latinos Need Barack Obama"
Kevin de Leon is California State Senate's current President pro tempore. He is running for U.S. Senate. 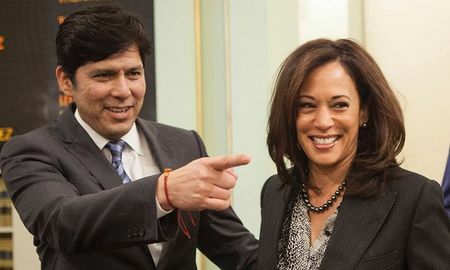 On July 15 2018, it was reported that Kevin de Leon won the support of the party leadership over Dianne Feinstein. He is a member of the Alliance for a Better California and the California Teachers Association. On January 17 2018, Pramila Jayapal protested with DACA activists from NAKASEC (Dae Joong Yoon Co-Director, Sam Yu Communications Coordinator), Tony Choi, Rob Bonta, Kevin de Leon, UndocuBlack Network, Asian Americans Advancing Justice (AAJC), African Communities Together leader and Local 23 President Bert Bayou and others. "Community members from the National Korean American Service & Education Consortium (NAKASEC), the UndocuBlack Network (UBN), Asian Americans Advancing Justice - AAJC, The New York Immigration Coalition (NYIC), African Communities Together and UNITE HERE Local 23 will host a timely press conference denouncing President Trump’s racist statements in his meeting with U.S. Senators last week and call for a DREAM Act that leaves family sponsorship and diversity visa programs intact by January 19th, the deadline for the upcoming Continuing Resolution (CR). In addition to impacted community members and community leaders, Congressional Asian Pacific American Caucus (CAPAC) Chair Congresswoman Judy Chu, CAPAC Immigration Subcommittee Chair Congresswoman Pramila Jayapal, California State Senate President pro tempore Kevin de Leon and California Assemblymember and Chair of the California Asian & Pacific Islander Legislative Caucus Rob Bonta will participate." De Leon spent part of his childhood living with his mother and sisters in a basement with a bathroom up a flight of stairs outside. He would ride the bus with his immigrant mother from San Diego’s Logan Heights to her jobs cleaning houses in wealthier neighborhoods. Fabian Nunez, California’s former Assembly speaker was a childhood friend of de Leon. De Leon was the first member of his family to graduate from high school and the first to attend college, at the University of California, Santa Barbara. De Leon went on to work as a labor organizer, and in 1994 he helped organize a massive protest against Proposition 187—the voter initiative, later overturned by the courts, that barred undocumented immigrants from receiving certain public services. Years later, he graduated with honors from Pitzer College in Claremont. And after defeating Christine Chavez, a granddaughter of the late labor leader Cesar Chavez to win a seat in the California State Assembly in 2006, he went on to amass a string of legislative victories on liberal causes from climate change to gun control to wage and labor law. At the April 2010 State Democratic convention in Los Angeles, the head of the powerful South Bay Labor Council, Cindy Chavez, called a face-to-face meeting with state Assemblymember Kevin de Leon of Los Angeles and labor leader Maria Elena Durazo. Chavez wanted to discuss de Leon’s fundraising activity for a San Jose City Council campaign. Chavez seemed to believe that as a longtime friend of labor, de Leon should have checked in with her before he endorsed Carrasco over Campos in the San Jose race. Chavez demanded that Durazo hold off on giving de Leon the labor endorsement in his own Senate campaign. Dan Reeves, de Leon’s chief of staff, says Durazo and de Leon left the meeting scratching their heads as to why Chavez was trying to assert political influence in a Southern California race. In the end, the pressure failed. Despite Chavez’s intervention, de Leon’s labor-friendly voting record earned him both the Democratic and LA labor endorsements without pause. Kevin de Leon is close to Democratic Socialists of America. #SanctuaryNow campaign making waves with a stellar feature by Jonny Coleman on the UCLA Choir @ DSA-LA's Sanctuary City teach-in. Oh, and Kevin de Leon showed up to have our members demand he be bolder on protecting the rights of ALL undocumented Californians. 🌹 No big deal. One of the most important ways of creating positive, people-friendly change is to make sure the people representing us at all levels of government are responsive to the needs and wants of the many, not just the few. Join us at a "Meet the Candidate" event for a candidate running for a California senate seat, where we can hear a potential future Senator describe his positions in his own words, and ask the questions of him that really matter. The group learned about the promising sanctuary policies in California State Senate bills introduced by liberal politicians like State Senate President Pro Tempore Kevin de Leon – which however were subsequently revised to protect only a fraction of those the politicians claimed to defend. An example is California State Bill 6, or the Due Process for All Act, which would require California to pay for legal representation for those fighting deportation in court with a statewide Justice Fund. Under pressure from centrist Democrats and conservatives in the state senate, the architects of this bill rewrote it to deny access to this legal representation fund for immigrants with criminal records, subsequently renaming the bill “Expanding Due Process Act.” The Los Angeles City Council and the city’s Board of Supervisors followed suit, revising their LA Justice Fund bills to unjustly exclude countless more immigrants from the basic human right of due process. Senator De Leon also introduced SB-54, another progressive piece of legislature that risks suffering the same fate. The original version of the bill would have dampened coordination between local enforcement and ICE by preventing local and state police from sharing information with ICE when they release any undocumented immigrant from detainment, regardless of the immigrant’s criminal status. But by April 3, when the State Senate approved the bill, SB-54 had been watered down so that this measure would apply only to undocumented immigrants who had not been convicted of an unreasonably long list of “serious” crimes – regardless of the time already served or the dates of those crimes. With pressuring de Leon in mind, our most recent action was a teach-in right outside UCLA’s Moore Hall, where de Leon was invited to speak at the “Moving Forward in Education” symposium, an event hosted by UCLA’s chancellor to discuss how to counter the Trump administration’s repressive policies. The teach-in featured speakers from organizations encountered by the group in the past months, including NDLON, Koreatown Immigrant Workers Alliance (KIWA), UCLA Chicana/o Studies department, UCLA’s Student Labor Advocacy Project (SLAP), DSA-LA’s Housing and Homelessness committee, our own Sanctuary City Working Group, and other undocumented student activists. Our teach-in, coordinated with a successful disruption by SLAP inside the event, attracted the attention of de Leon himself, who came out and personally offered to speak with the group further on the issue of the state bills. These rock stars are why we are able to call Kevin de Leon the endorsed Senate Candidate of the California Democratic Party — with Stacy Fortner, Manuel Zapata, David Atkins, Josh Donner, Richard M. Mathews, Clifford J. Tasner, RL Miller, Cathy Willott, Varsha Sarveshwar and Logan Smith. SB100, a bill that will bring California to 100 percent clean energy by 2045, after nearly a year of being held up, has advanced to the Assembly floor!!! Yuge thanks to author Kevin de Leon and coauthors Todd Gloria, Lorena Gonzalez Fletcher, and Nancy Skinner, as well as RL Miller, Richard M. Mathews, Amy Hines-Shaikh, and everyone else who has worked hard to get the bill moving again! The bill will be voted on in August, after the Summer Recess. Everyone needs to start contacting their Assembly members (you can find them here: http://findyourrep.legislature.ca.gov/) and ask them to pass SB 100! Anthony Thigpenn ran successful field campaigns for Los Angeles Mayor Antonio Villaraigosa, Congresswoman Karen Bass, State Senator Kevin de Leon, and former City Councilmember Martin Ludlow, among others. These are the words of Anthony Thigpenn, founder of SCOPE, and one of our respected honorees at a March 2014 celebration of SCOPE’s 20th anniversary. In his address to a room of over 300 allies and friends, Anthony reminded us that we didn’t have all of the answers when we first came together. But for SCOPE, “having the answers” was never the driving force behind our vision for change. Instead, we set out to empower the residents of our community to think for themselves, to design their own solutions, and to speak out on issues that affect the quality of their lives. Our founders believed that our community had the answers to the problems plaguing South LA—and from looking around the room last Thursday, it’s clear that they were right. 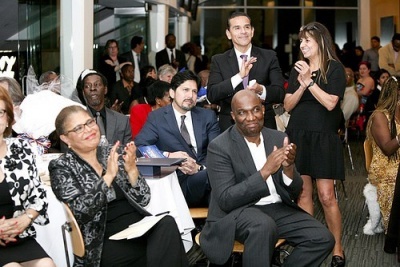 Attendees included Manuel Chavez, Gloria Walton, Lynette Steele, Patricia Livingston, Clementina Lopez, Latrece Jackson, Sherri Wallace, Anthony Thigpenn, Jennifer Speck, Chante Harriel, Maria Virginia Otero, Mari Mercado, and Juan Canto, Congress member Karen Bass, Shay Salter, Chris Nixon, Kevin de Leon, Antonio Villaraigosa, Manuel Pastor, Soloman Rivera, Manuel Hernandez, Veronica Carrizales and Maria Elena Durazo. Many of SCOPE's members standing alongside activists, community organizers, elected officials, union leaders, academics, and educators attended. Proof that South LA’s progressive community is strong, thriving and growing. The meeting honored Gerry Hudson, Paula Litt and Barry Litt and Anthony Thigpenn. Sacramento Progressive Alliance, Saturday, May 26, 2018 Progressive Alliance Voter Guide - Updated. We are so proud to introduce our FINAL ENDORSEMENT SLATE for 2018! Every one of these candidates has sworn off fossil fuels and is ready to fight like hell to stop climate change and protect our futures. Check out the full slate here and join us to get bold candidates elected this November: sunrisemovement.org/endorsements — with Deb Haaland for Congress, Ilhan Omar for Congress, Jess King for Congress, Randy Bryce, Representative Chloe Maxmin, Benjamin Jealous, Kevin de Leon for U.S. Senate, Dana Nessel for Michigan Attorney General, Andrew Gillum, Zellnor Myrie, Alessandra Biaggi, Greta Neubauer for Assembly District 66 and Rashida Tlaib For Congress. In 2018 Progressive Democrats of America endorsed Kevin de Leon, for US Senate. This page was last modified on 5 February 2019, at 13:58.